HMS National has been working with homeowners and real estate agents to provide home warranties for over 30 years. The company partners with Cross Country Home Services, which gives them access to over 40,000 licensed and insured home contractors. They are also a member of The National Home Service Contract Association, a non-profit watchdog that signifies quality workmanship and service. HMS National provides home warranties to homeowners, real estate agents and their clients throughout the United States. Because of their extensive network, they offer a wide variety of plans which may differ depending upon region. A sample plan for a single family home includes coverage for primary kitchen appliances like a refrigerator, dishwasher and stove/range/cooktop. It also includes systems such as air conditioners, heating systems, plumbing, electrical systems and water heaters. Consumers can then choose to customize their plan by adding coverage for things such as washers and dryers, swimming pools, spas, well and sump pumps, jetted bathtubs, additional heating systems or air conditioning units, water heaters and extra refrigerators. Coverage may vary, and certain items that are included in the basic plan for some states may be optional add-on coverage in others. HMS National home warranty holders get access to Appliance Buyline as an added perk. Appliance Buyline carries name brand appliances at a large discount, and only members can utilize this savings opportunity. HMS National’s plans, no matter the location of the purchaser, do not include coverage of commercial or luxury appliances, so consumers who own high quality appliances may be disappointed when it comes time to file a claim. 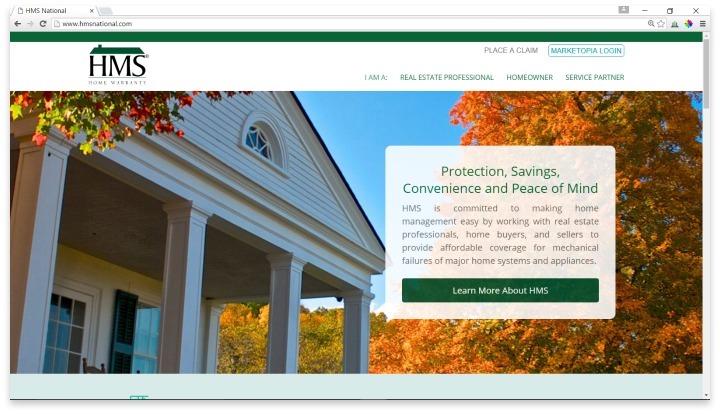 HMS National caters to real estate agents, helping them keep track of their clients’ homes. The company has an online portal, called Marketopia, that allows the agents to get access to their plans at anytime. The fact that HMS National works with many real estate agents is a good thing for consumers, especially those working with an agent. The agent brings the company many customers, so HMS National wants to keep them happy. Therefore, they have huge incentive to provide excellent, fair service when it comes to fulfilling claims. Once a purchaser’s warranty is active, they can submit a claim by calling the HMS National hotline or by filling out a form online. After the claim is submitted, the homeowner will be provided with a service provider so an appointment can be made. When the contractor comes to the home, the warranty holder will pay a deductible, and the contractor will diagnose the problem and submit their findings to HMS National for approval. Once approved, HMS National will pay for the repairs or a replacement, depending upon the cost of the original diagnosis. Many consumers report excellent experiences with the contractors assigned by HMS National, but a small amount do complain of late arrivals, lack of communication or ability, and unprofessionalism. It appears that HMS National is willing to work with the consumer to substitute contractors when possible. When an appliance or system needs to be replaced, HMS National chooses the replacement item. If the warranty holder doesn’t want the exact item picked by the company, they can receive a cash payment that can be used towards a repair or replacement picked by the owner. The cash payment is almost always lower than the cost to replace, so the policy holder will have to pay out-of-pocket for the rest. The consumer also has to provide a receipt proving the purchase of the new appliance before they will get the payment from HMS National. However, the consumer can save on the purchase by utilizing the Appliance Buyline program that comes with the purchase of the HMS National warranty, and HMS National representatives will work with the consumer to help them find a product in the range of the amount of the payout. HMS National provides home warranties to homeowners, and real estate agents and their clients, throughout the United States. Because of their wide network, they offer differing plans that vary depending upon region. HMS National provides home warranties to consumers around the nation, but the company is geared towards working with real estate professionals and their clients. One of the main complaints most warranty providers receive is the low-payout system when it comes to replacing broken appliances and systems. HMS National makes this industry standard a little less painful by providing access to the Appliance Buyline program. Because plans vary by location, consumers should thoroughly read any contracts to fully understand the benefits in place with the plan they sign up for. Have you had an experience with this company? Please share your HMS Home Warranty reviews below. 20 days without heat in the dead of winter. That should say it all. About a dozen calls to HMS during that time, plus emails. Furnace parts ordered? Maybe one part for each of the three weeks. Still need a few more before repair MAY happen. The heating guy was great, but he, too, has no faith that HMS will ever come through. Company could have had me as a customer for years had this worked out. Instead, this will be my first and last claim.